I need to hook some momentary and toggle switches up to the analog inputs of the brain jr.
hoping someone might be able to tell me how I should go about this - I know I might need a resistor in there somewhere but i'm not sure what kind or where it needs to go. 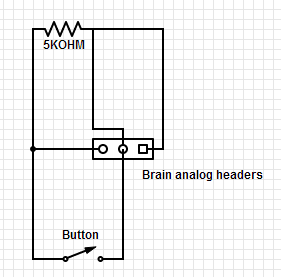 So basically you are trying to get more digital inputs by using the analog inputs? With a resistor this should be possible, I managed to do so. I have made a little schematic if anyone wants it. that's exactly what I'm after! Could you please put the schematic up? What value resistors did you use? I've tried a few things but so far no luck. I bridged the switche with a 5k resistor. In the brain configure software i set the type to "btn" and enabled flip. Here's the schematic of what I was using incase anyone wants it. I don't know if this is the best way to do it since I don't know that much about electrical engineering. This was exactly the thing I was looking for, tx!